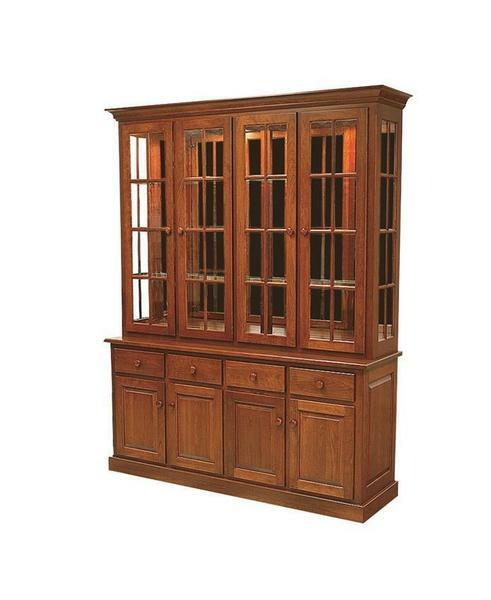 This gorgeous, solid wood four door hutch comes standard with glass shelves, touch lighting and a mirror back. It's a full 71" in width and 86" in height - an Amish furniture masterpiece made in the Shaker style. Known for clean, smooth lines, excellent joinery, and high quality, simplistic designs, the Shaker style is one of the most well know and sought after styles of furniture. The Shaker principles inspire many modern furniture designs because of their emphasis on simplicity and functionality. Our talented Amish carpenters are masters at this style of carpentry and are dedicated to creating each piece in the Amish tradition of quality hand craftsmanship and detailed construction for an heirloom quality piece that will last a lifetime. Every part of the craftsmanship is executed at the highest quality - the dovetailed drawers, the selection of fine hardwoods, the detail in design, and the beauty of the finish. What better way to showcase your family treasures than in an heirloom quality masterpiece? This hutch will be a cherished family heirloom for generations! Base Doors are standard with solid wood.